Do you love dance? Not sure? Well here’s your chance to fall in love, or fall in love all over again, with dance. The stock in trade of many teaching dance companies is ballet, the cornerstone of form and technique. At our Vashon Center for Dance, we’re all about that. But we hardly stop there. Indeed, our students can expand their horizons in lots of different directions . . . jazz, modern, tap, hip-hop, and Mexican Ballet are just some of what’s on offer. 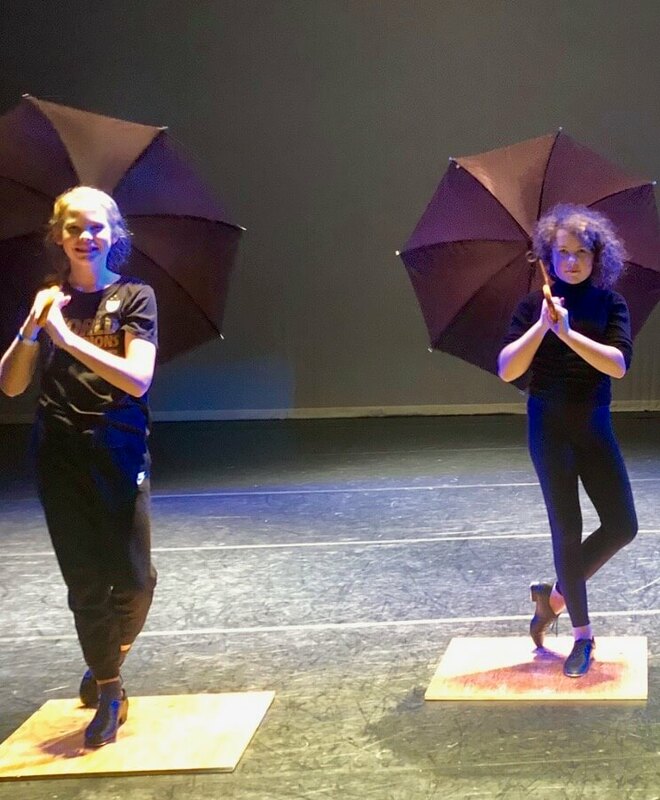 One of the things that makes our program unique is our commitment to supporting and presenting Original Works by both students and teachers. Our team has been working on bringing the 2019 edition to life for literally months and the rehearsals started this week. 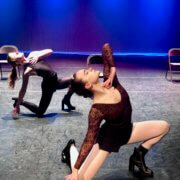 For those who know, my daughter is a professional dancer, so I readily confess a soft spot for dance. 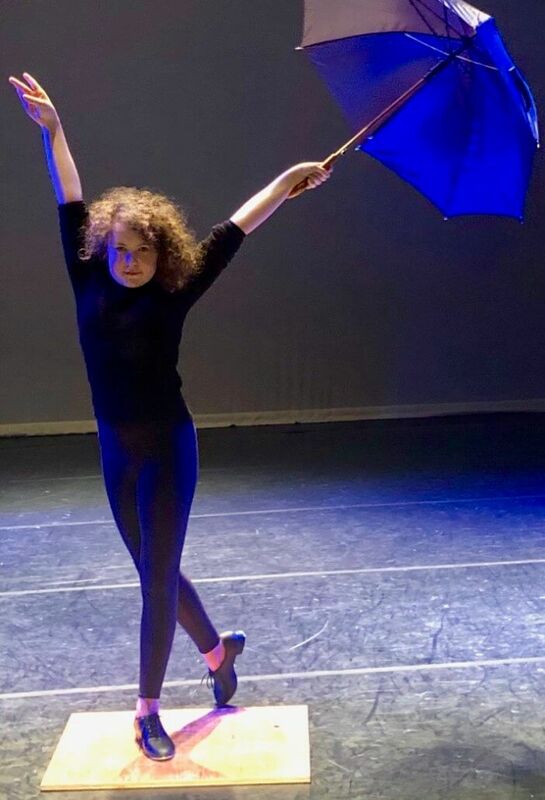 Even stipulating to that, I have to tell you the work our dancers are putting on stage March 22 and 23 is simply fabulous. And original, in some cases down to the music, costumes, backgrounds, choreography, and casting. Honestly, and I mean this, you will have to search a long way to find another dance company that gives its students the opportunity to showcase this much of their vision and talent in such an original way. Here are some fun photos of an early rehearsal. 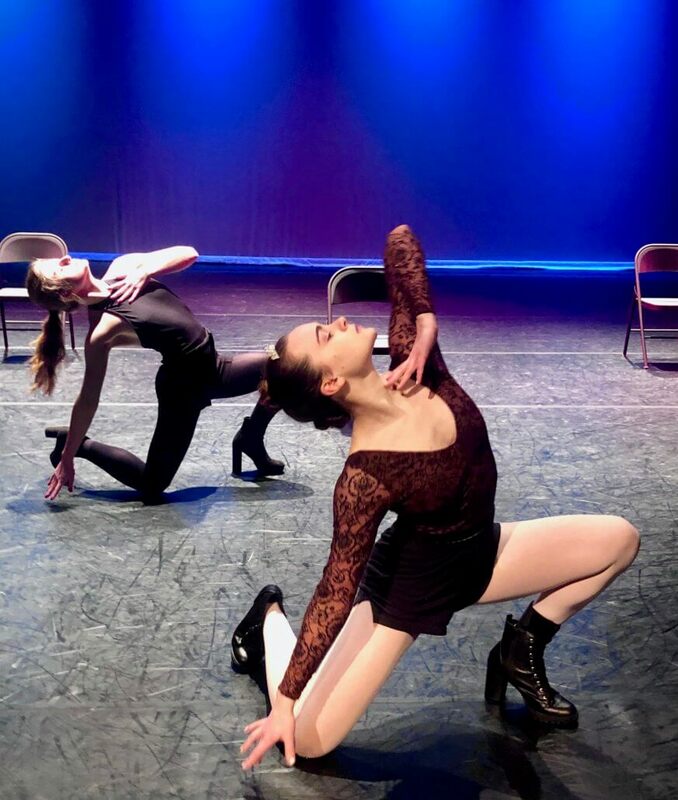 First, a couple of our upper level dancers working on their intense piece that will have our audience with shocked with how amazing their creative work is. Next are new Original Works dancers hard at work, with Grace Harvey coaching her group; and an image of her costume design book as well. Finally, there is our amazing choreographer/teacher Vanesa working with her Modern 3 group on a piece that will knock your socks off. And in late breaking news from our Associate Dance Director, Crissy Baker . . .
Tappers have been excited about their tap boards. They sound great in the theater! The upper level dancers have some surprises up their sleeves for the audience. 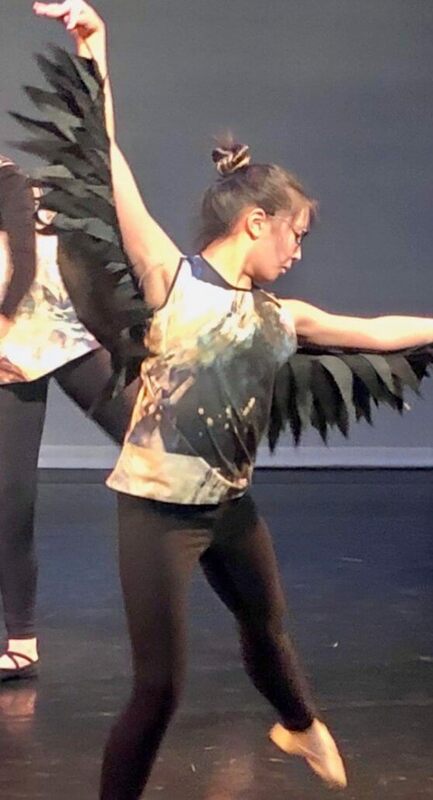 And Allison’s “birds” have been taking flight across the stage. The show is going the be fantastic! Michael also has been bringing his creative magic to the stage and designing each every piece to have their own individual beautiful look in this show. We’re so happy to have his help and support. Ray Pfortner—island treasure and frequent collaborator with VCA—is getting ready to host his 15thAnnual “Shoot to Show” class through our Arts Education department. Got a camera? Then why not jump in and be part of this historic celebration of a program, an art form, and our island?! This year, the theme will be “Portrait of Vashon,” which seems fitting, after so many iterations of this wonderful class, that we’re going to focus on the faces and people of our amazing island. Of course, teens and adults aren’t the only ones who get to tap into their photographer talent this spring. I got so excited thinking about the class, I decided to take a few “behind the scenes” photos here at VCA. We can’t wait to show you and your camera around! While we’re on the subject of classes, I want to draw your attention to an amazing array of Spring Classes we have on offer. Surely there’s something here for everyone. Classes are starting soon, so get in on the fun! You can sign up for arts education classes here. You can sign up for dance classes here. If you need financial aid, click here. As I hope you know by now, we are premiering the first-ever VashonLitCon in April. The event is being produced by our very own Angela Gist. I asked her some questions the other day and thought you might enjoy the answers. Me: What is your vision for Lit Con? Angela: Reading and writing are both immersive experiences. I loved the idea of setting aside a few days to give ourselves this gift of learning and discovery. The opportunity to meet authors and hear their viewpoints and to share this experience with fellow bibliophiles in a beautiful setting like Vashon is my idea of a perfect long weekend. Me: What’s important/different about your vision? Angela: For our first Lit Con, I wanted to feature the writers, instructors, and artists who make our island and the region rich with literary arts. I want the various events to be comfortable, welcoming and exciting, like the feeling you have curling up with a great book. My hope is that we are creating an event wherein writers hear about it and want to be a part of it because they seek the comradery with fellow writers as well as their own opportunity for learning and discovery. Me: Can you give us a couple of teasers? Gary Copeland Lilley is the author of eight books of poetry, the most recent being The Bushman’s Medicine Show, from Lost Horse Press (2017), and a chapbook, The Hog Killing, from Blue Horse Press (2018). He is originally from North Carolina and now lives in the Pacific Northwest. He has received the Washington DC Commission on the Arts Fellowship for Poetry. He is published in numerous anthologies and journals, including Best American Poetry 2014, Willow Springs, The Swamp, Waxwing, the Taos International Journal of Poetry, and the African American Review. He is a Cave Canem Fellow. Michael Meade, D.H.L., is a renowned storyteller, author, and scholar of mythology, anthropology, and psychology. He combines hypnotic storytelling, street-savvy perceptiveness, and spellbinding interpretations of ancient myths with a deep knowledge of cross-cultural rituals. He is the author of Awakening the Soul: A Deep Response to a Troubled World, The Genius Myth, Fate and Destiny: The Two Agreements of The Soul, Why the World Doesn’t End, The Water of Life: Initiation and the Tempering of the Soul and editor, with James Hillman and Robert Bly, of Rag and Bone Shop of the Heart. He is also the creator of the Living Myth podcast. Readers of the Fish Wrap know my enthusiasm for wood, and our lobby is and has been home to some really lovely pieces. Tom Northington is the man responsible for the stunning front desk and the companion benches. James Chesney showed us his mighty chairs this past summer and the biggest of them stayed behind thanks to a generous donor. The good folks at Forrest Stewards lent us a pile of their best slabs, and true to form, one found a permanent home thanks to a donor. Heat and a decided lack of humidity have taken a toll and this week both Tom and James stopped by to tune up their show pieces . . . and Terry Timmons, the man who did the finish work on our slab table was by last week to buff out some scratches and give the mighty surface a refreshed finish. Gentlemen, thank you for your craftsmanship, support, and good cheer. On Thursday, many of us on the island got an email that reads . . . TOMORROW – March 15, 2:15PM, Cemetery road and Vashon Highway. Vashon Youth & Grown-up Allies of All Ages. Come out and cheer their activism! See details HERE. In this case, the message carrier is Greta Thunberg, a 15-year-old Stockholm native who lives at home with her parents and sister Beata. The Swedish teenager – who on her Twitter page describes herself as “a 16-year-old climate activist with Asperger [syndrome]” – first staged a school strike for the climate in front of the Swedish parliament in August last year. She hasn’t stopped. Her strike has inspired students from around the world, leading tens of thousands of students from Germany, Japan, the UK, Australia and many more to join her #FridaysforFuture demonstrations.Friday’s protest is billed as the biggest so far. Listen to Greta’s TEDx talk and get inspired about the power of an idea, the power of listening to that idea, and the power of taking the first step in service of that idea. It’s powerful stuff, regardless your politics.